Have you seen this cool, make-it-yourself advent calendar at Mr. Printables? 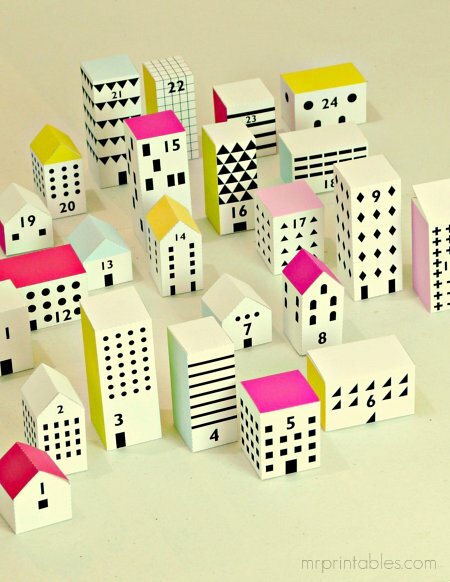 Build a set of geometric-patterned boxes that look like buildings, numbered 1 - 24, to form a Christmas city. You have read this article christmas / downloads / paper / printable with the title Printable advent city. You can bookmark this page URL http://jenkrebs.blogspot.com/2012/12/printable-advent-city.html. Thanks! No comment for "Printable advent city"